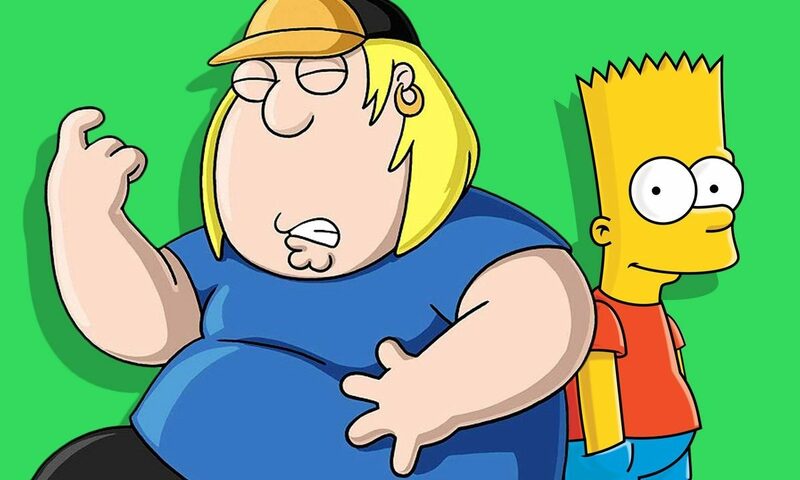 Bart Simpson and Chris Griffin are co-starring in a new comic take on couple’s therapy. Family Guy has been drawing ever closer to the narrative of The Simpsons, littering the show with couch gags and references – and in 2014, fans finally got their 45-minute crossover episode, The Simpsons Guy. While Bart Simpson (voiced by Nancy Cartwright) actually bonded with Stewie rather than Chris Griffin (voiced by Seth Green), perhaps the two eldest sons became closer than we expected, if this dark comic is anything to go by. Panic Volukushka’s poignant comic reconnects with Chris and Bart in their thirties, haggard and damaged by their strange two-dimensional upbringings. The men have found solace in each other, and are depicted at a couple’s therapy session with their therapist, R.J. Hill – who you’ll probably recognise from King of the Hill. With Dr Nick nowhere to be found, the two men share their deep shame regarding their upbringings. Bart tells how he lived in fear that his violent and abusive father would one day turn on his mother, Marge, or two sisters, Lisa and Maggie. In a poignant antithesis, Chris explained how he went along with his father’s degrading behaviour towards Meg because he was afraid to be victimised by his family’s cruel barbs himself. Luckily, by using a series of understanding statements, Bart and Chris manage to work things out. Roll the credits.